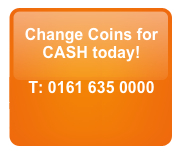 At cash4coins we will exchange coins and convert them into Sterling currency for you. We all have foreign change and foreign coins lying around from holidays abroad and business trips. Why not exchange coins with cash4coins and convert the leftover foreign money into UK currency right now! Banks will not exchange coins and convert them into UK currency. However, we will. We buy foreign currency in the form of coins and will pay you in Sterling, which means that you can at last get some value from your foreign change collection. Why leave your foreign coins sitting around collecting dust when we can exchange coins into Sterling for you. It’s quick, it’s fast and it’s convenient. We exchange all coins such as Euro, Dollars, Yen, Pesetas and everything in between – we even exchange old British and Irish coins! Have you got any old British coins that you didn’t have a chance to exchange before the deadline? If you do, we can change them for you. That might be music to your ears if you have jars and jars of coins that you thought were useless. Above certain weights we’ll even collect your foreign coins for FREE – please go to ‘How to send us coins‘ for full details. We do all the counting and sorting saving you the trouble of doing it yourself. Many of our customers exchange coins as a fundraising idea for charity or for their local school, hospital or club. Collecting foreign coins is a very simple and effective way of fundraising and can be carried out by almost anybody. Just collect the coins and send them to us, we will sort, count and collate the coins and then pay you in Sterling via cheque or directly into your bank account by BACS or by Paypal (if you have a Paypal account). For many businesses these days times are tough. And for those that accept (either willingly or unknowingly) foreign coins then this can make a difference to cashflow. The good news is that we help lots of businesses monetise foreign coins that were previously useless. For example you may be a shop, bar or restaurant in a busy tourist destination such as London, a local authority or tourist attraction that gets foreign coins through normal daily operations or an airport or airline. Whatever your situation we can help you with your foreign coins. Contact our team today for help. Don’t let all that foreign currency go to waste use the cash4coins service to exchange coins now. We would be delighted to assist you and our friendly team is on hand to help you with your questions. It’s never been easier to exchange coins for Sterling and we are the company to help. Remember, this is a service that the bank cannot help you with, but we make it easier than ever. Turn that old currency or foreign currency into money that can work for you. A night out, a shopping spree or simply extra money to pay the bills – this is what our many customers are doing with their Cash4Coins money.